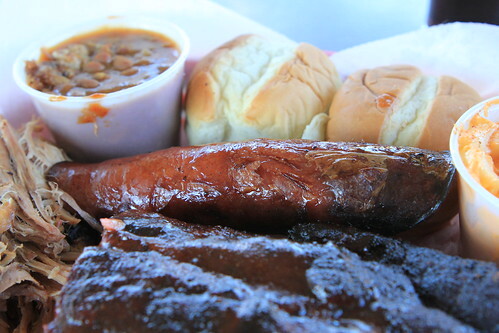 At this point, it seems like I’ve covered a number of the big names in Memphis bbq: Payne’s, Cozy Corner, Neely’s Interstate BBQ, Germantown Commissary, Corky’s, and the lackluster Neely’s, but there’s always more to try in this BBQ Mecca. So the last time I was Memphis, I decided to stop by a restaurant that is often named in Memphis bbq discussions, Central BBQ. 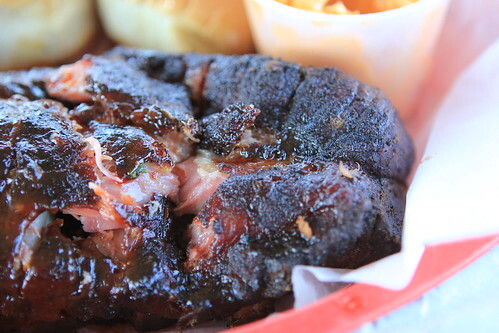 If there is one major challenge to eating bbq, it’s knowing what to order. 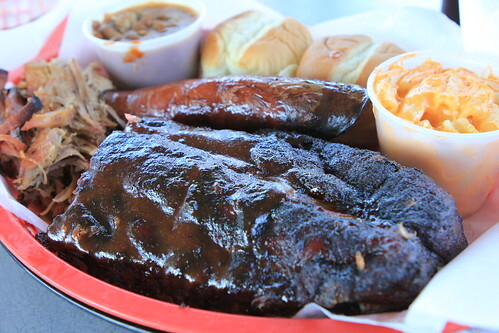 Presented with a full menu of options, I typically decide the best thing is to try as much as possible and at Central BBQ that could only mean a rib combo plate. It wasn’t long before my order was ready and what better place to start than with smoked wings? Typically, wings would be the last thing I’ll order at a bbq joint but a ringing endorsement from Full Custom BBQ made me give them a go. In my experience, bbq chicken wings are a gummy, smoky affair that is best avoided but these wings were miles ahead of any bbq wing I’ve ever eaten. 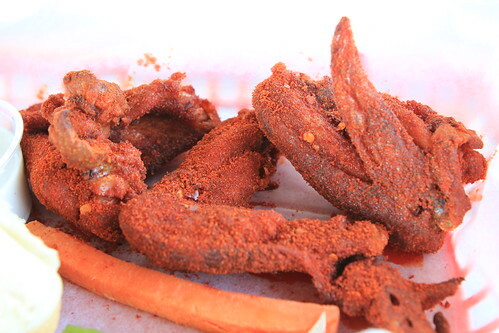 Each bite was rewarded with a crispy crunch and a full assault of smoky and spicy paprika flavored seasoning. 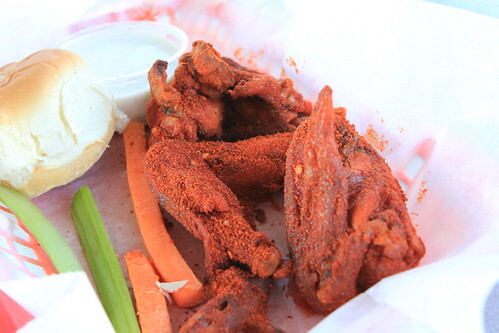 Even after being smoked and deep fried, the only downside to these wings was the lingering heat of the dry rub made me wish I had ordered more than three. 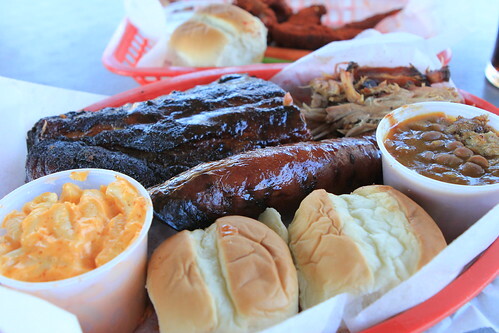 With the wings little more than a pile of bones, it was time to move to the rib combo plate. Skipping the bologna on this visit, I decided to try Central BBQ’s hand at sausage, pulled pork, and ribs with mac & cheese and baked beans for my sides. Working left to right, the pulled pork was first on the chopping block. It did seem a little strange that the pulled pork arrived without any sauce but I took it as an opportunity for the pork to stand on its own merits. How did it fare? Not particularly well. There may have been a little flavor from the rub and hickory smoke but without sauce this pork was overcooked and chalky. The pulled pork may have needed sauce to be worthwhile but the sausage needed no such help. 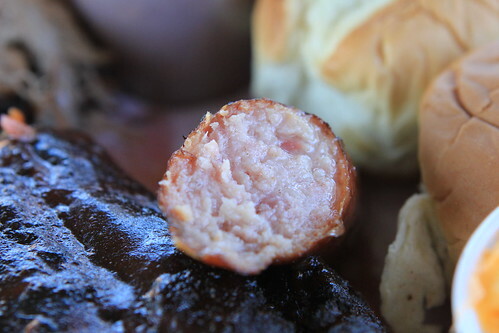 A pleasant snap to the casing, a hot and juicy interior, there was no mistaking a well cooked sausage. While I’m still unsure about the type of sausage (I’m thinking kielbasa), it was a solid choice for the combo plate regardless of type. 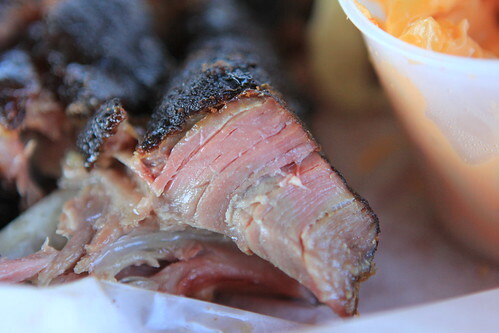 Hoping for the best of both worlds, Central BBQ was kind enough to serve my order of ribs half dry and half wet. I did think it was interesting that there wasn’t any additional rub on the dry ribs. That’s right; there was nothing but well smoked, juicy pork ribs with surprisingly little rub flavor. In addition to the rosy hue of the smoke ring, the texture was spot on as well. The meat didn’t fall off the bone, but it did need a gentle tug. Oddly enough the wet ribs pulled off the bone much easier than the dry. 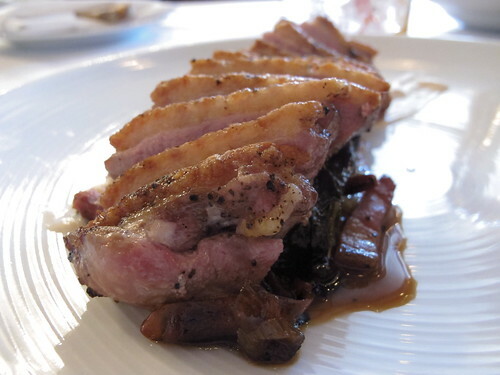 The texture of the meat was still superb while the sauce was sweet but relatively benign. 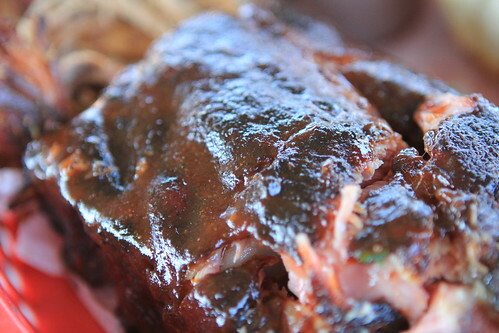 Far from overwhelming the flavor of the ribs, it did little more than add moisture and a dimension of sweetness. 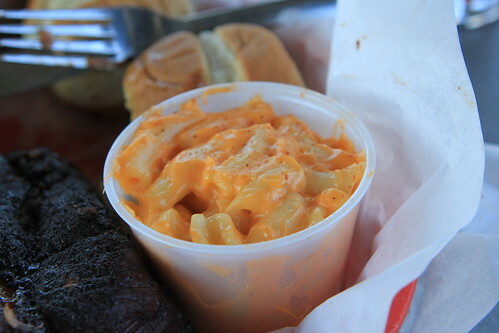 A combo plate wouldn’t be complete without the sides. 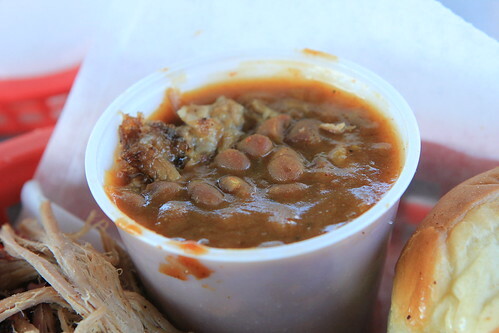 There was a decent mustard flavor to these baked beans and a nice amount of pork. It was also refreshing to taste some baked beans that weren’t tooth achingly sweet. This mac and cheese was insanely thick and quickly forgotten. As infrequently as I visit Memphis, I’m far from having a working hierarchy of best bbq joints, but Central BBQ deserves another meal if only for their smoked wings. The wings with their captivating rub and the snappy sausage were the real highlights of the lunch with the ribs lagging just a bit behind. As for the rest of the plate, some things are best left unsaid. We’re nearing the middle of January. The holidays are over, there’s playoff football on tv, I don’t have any big travel plans on the horizon, and I can no longer put off what has been a fairly fulfilling hobby for the past four or five years. With a new front of rain and cold weather making a grand entrance, I decided to see what was next in my alligator clip of restaurant notes. Sometime in late October, my dad and I made a quick day trip down to New Orleans. While we never need a good excuse to visit the crescent city, a visit to George Bass and restocking on tasso and andouille at Cochon Butcher were the main goals. Of course, no trip to Nola is complete without a fine meal and that prompted the eternal question of where to go. Although I’ve been partly following the wave of burger joints that are now dotting the city, I wanted something a little more refined. Enter this post by Rene of Blackened Out. Although I don’t always completely agree with Rene and Peter’s assessments of restaurants, I’ve come away happy with their recommendations more often than not. So after a quick stop in the CBD and filling the cooler in the Warehouse district, we made our way up Magazine to Coquette. 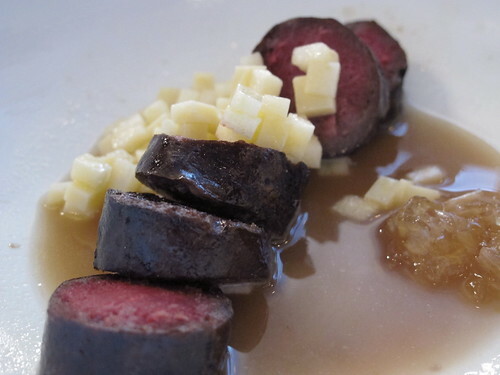 Rarely seen on menus and even more rarely seen on this site, our time at Coquette began with a small plate of blood sausage. 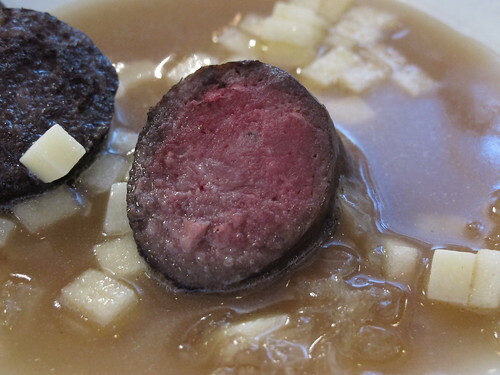 Seeing housemade charcuterie on the menu may have become old hat but it takes gumption to serve blood sausage even with an onion broth, diced gala apple, and Hook’s cheddar. 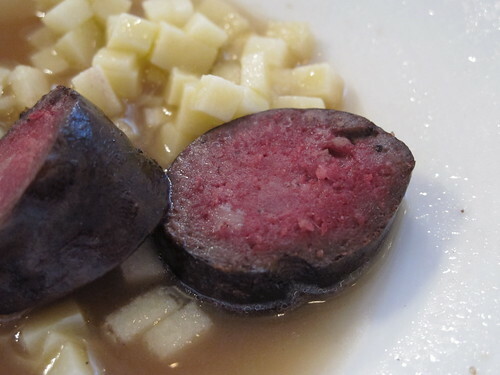 Boldness aside, I was surprised at the mild flavor of the blood sausage. Each began tasting like a meaty, slightly overdone piece of andouille that finished with a tail of iron flavor. When combined with the sweetness of the onions and apple, everything worked quite well but thankfully, with every bite, that tail reminded you just what you were eating. The next small plate was a much more benign meat but no less flavorful. 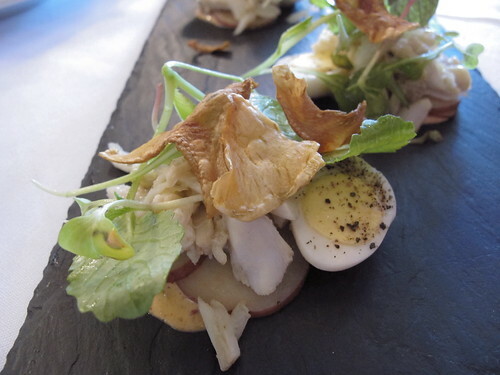 Served on a piece of slate, this boiled Louisiana crabmeat was paired with remoulade, boiled potatoes, quail eggs, and artichoke chips. Sweet and spicy claw meat, a creamy remoulade with a manageable heat level, and sublimely hard boiled quail egg were good enough to eat separately. 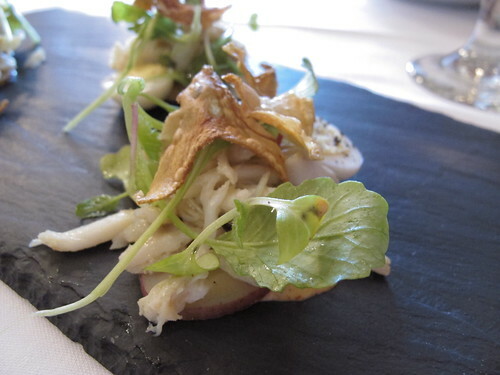 While each component was brilliant on its own, when combined, they made a refined and endearingly spicy crab and potato salad. Although I had picked Coquette specifically to avoid a burger for lunch, I had a hard time stopping myself from order the Coquette burger. 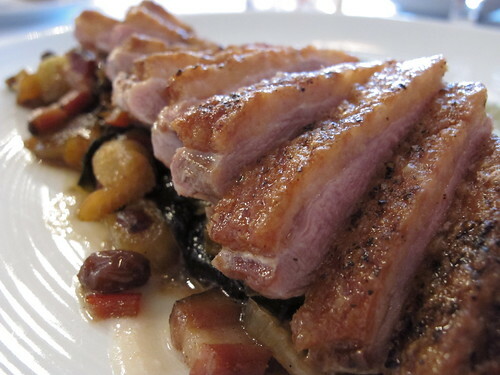 The pull of good cheddar, bacon, and chanterelles is that strong, thankfully pull of well cooked duck breast is stronger. According to the Coquette menu, this plate was little more than duck, jalapeno, bacon, and quince but there was much more than quartet. 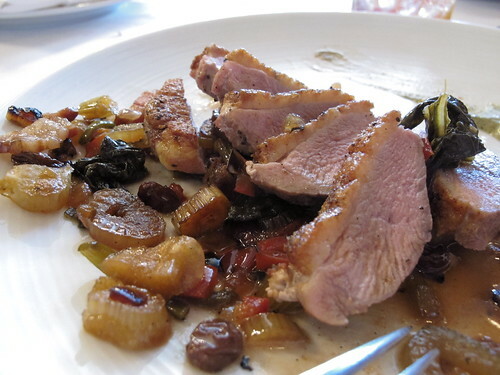 Beneath the cracker crunch skin and more than medium rare meat of the duck was a sweet and sultry underbelly of collards, bacon, quince, and sweet pepper jam. 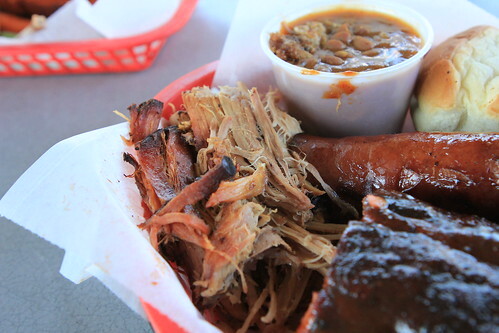 the fact that every other bite was punctuated by sweet and smoky flavors of its bedding put things over the top. 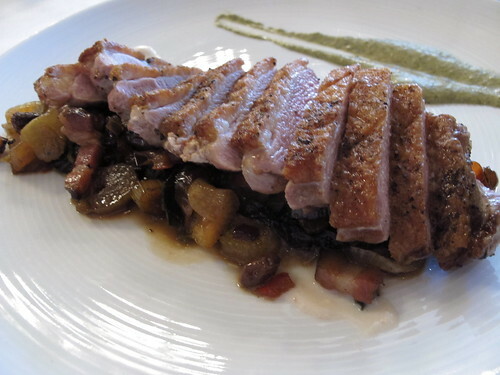 After sharing two small plates and, for lack of a better word, gorging on a large plate of duck breast, I was ready to call it a day and begin making our way north, but my father had taken advantage of Coquette’s excellent three course lunch option and his dessert had just arrived. 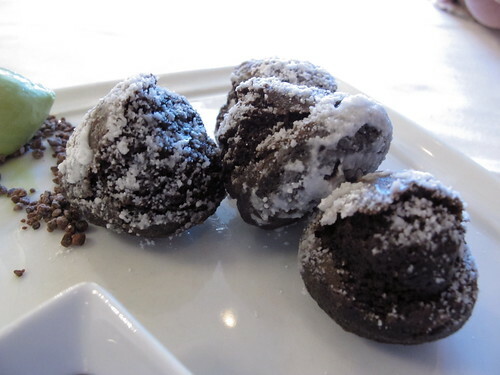 Called chocolate munchkins, this little balls were bite size pieces of brownie with a coating of powdered sugar. 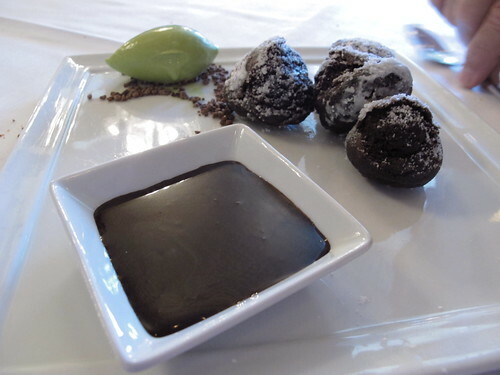 With a crispy exterior and a cakey if a bit dry interior, they were delectable with the hot fudge. 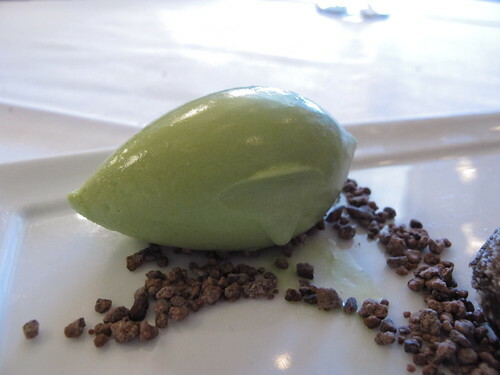 But the real treat came with the fudge and munchkins were combined with the quenelle of mint ice cream, it was a complete mint chocolate cake. 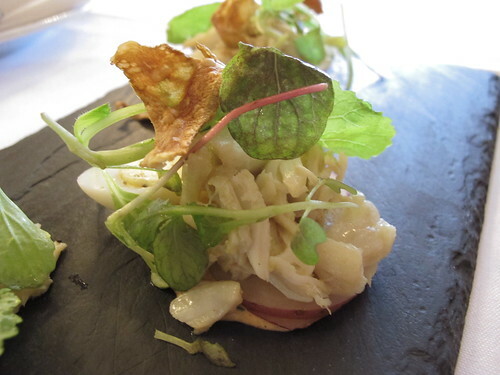 One thing that’s painfully obvious about Coquette is that their three course lunch for $20 is a steal but my three courses were no slouches either. The bottom line is there was not a weak link to any of the six dishes we tried and while I can’t speak for the local greens or the shrimp and grits, the four I got my hands on were superb. I’d have to at least be back for dinner before I get anywhere near Rene’s assessment of Coquette as a potential model for favorite restaurant, but three or four more meals at Coquette sounds like a fine idea to me.